Do You Have Confidence In Your Purpose? I survived, like we all do, against the odds. I should be dead. I should be a statistic. I shouldn’t be scribbling all over this page trying to describe the indescribable. So what happened? Was it chance, an accident, or dumb fate that I’m here now, a thirtysomething rock-and-roll mom looking back and collecting pieces of hope to give you? I don’t believe in fate or accidents. I believe in cause and effect. Behind everything lies a cause, a reason. Why does the sun rise? Because the earth revolves once every twenty-four hours. Why do we read? Because, some say, we don’t want to feel alone. Why am I alive, writing to you? Because I want to tell you that miracles happen. Because I want you to know how precious life can be. Because I want you to know how valuable you really are. Because the world will throw lies at you—lies aimed at your heart, aimed to kill. I choose not to listen to those lies anymore. Cause and effect. Our lives stretch out like shafts of light reaching into the lives of everyone else. You and I, we sparkle with reason, a cause, a plan. We’re like a giant web of light and meaning and sadness and wonder. What if you and I lived like we knew this? What if we lived with the confidence that comes from walking in the bright of day? What if we treated one another with the love we desire for ourselves? What would happen if we understood how our lives touch every person we encounter in this world? I strive to rest in the fact that I am made for a purpose. Knowing my life has purpose gives me confidence. When I live in the light of that confidence, it can empower you—it can make you confident as well. It can help you see yourself in truth and live unafraid, and when we live unafraid we live in the light of love. For true love casts out fear. That’s how we sparkle; that’s the web of light I see stretching from heaven into my life, into yours. 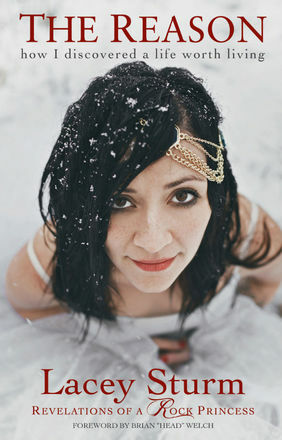 Excerpted from The Reason: How I Discovered a Life Worth Living by Lacey Sturm, Baker Books, a division of Baker Publishing Group, © 2014. Used by permission.